Speech recognition. It’s so easy a kid can use it, and best of all, if you’re a Windows 7 user, it’s right under your fingertips. Their built-in speech recognition program has been one of the best kept secrets of Windows for years. Why spend hundreds on a voice recognition software package when you can use a similar program that came with Windows? And thanks to the surge of use of voice recognition in mobile technology devices (like iPhone’s Siri) over the years, people are more interested in voice recognition than ever before. This guide will outline how to set up Speech Recognition in Windows 7 so you can make it as seamless and accurate as possible. First things first, start up Speech Recognition. 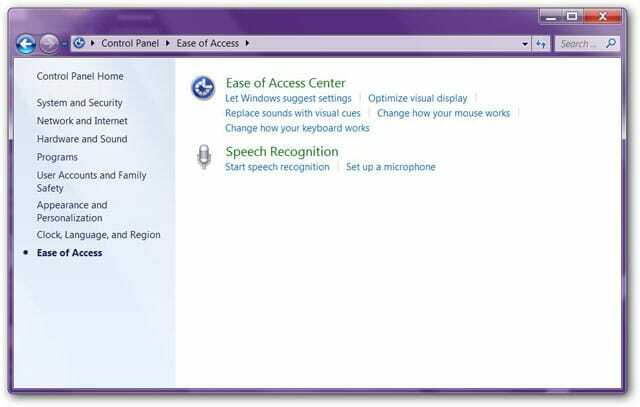 Speech Recognition is easily found by navigating to the “Control Panel > Ease of Access Center.” In the Ease of Access folder, the Speech Recognition program will be listed directly under the Ease of Access features. 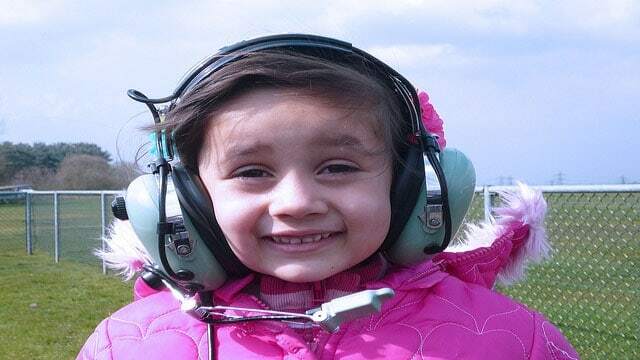 Click “Speech Recognition” to begin the process of setting up the program. Before you use Speech Recognition, your need to set up your microphone. After you click on Speech Recognition, a list of configuration options will appear. 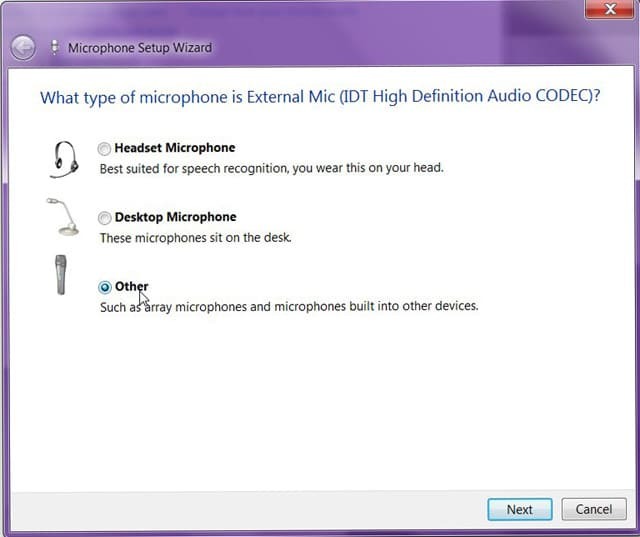 Whether you plan on using a headset microphone, a desktop microphone or another microphone, like your computer’s built-in microphone, your computer wants to know. You could use the program without doing this step, but like with most voice recognition programs, it will work better if you set it up as cohesively as possible with your hardware, especially your microphone. Click on Set up Microphone from this list. The Microphone Speech Recognition Wizard takes just a minute to complete. After specifying the type of microphone you’ll be using, it will ask you to read a sentence so it can configure the volume and proper placement of your microphone. After you read the sentence, click “Next,” and your microphone set up is complete. This tutorial will go over everything you need to know to use the program fully, including the most frequently used basic commands, dictating (the most important section for many) and using the program with Windows. Speech Recognition has several uses beyond dictation. The good news is that if you’ve used a voice recognition program before, the learning curve is relatively simple with Speech Recognition in Windows 7. 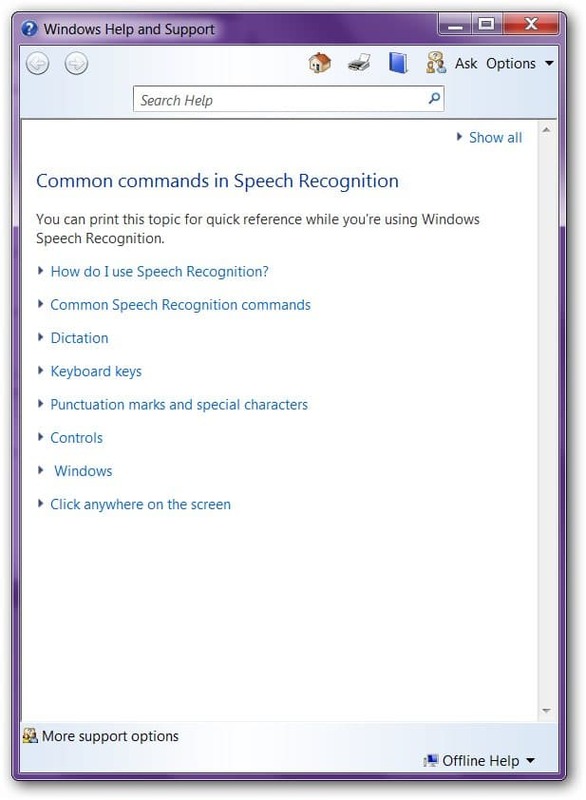 Windows also provides a Speech Reference Card (which you can keep open as you use the program) that lists common commands in Speech Recognition. After you’ve taught yourself the basics of the program, your last step is training your computer to better understand you. No voice recognition program, even an expensive program, will work seamlessly with your voice right off the bat. Training a voice recognition program to get comfortable with your voice will greatly improve its accuracy. 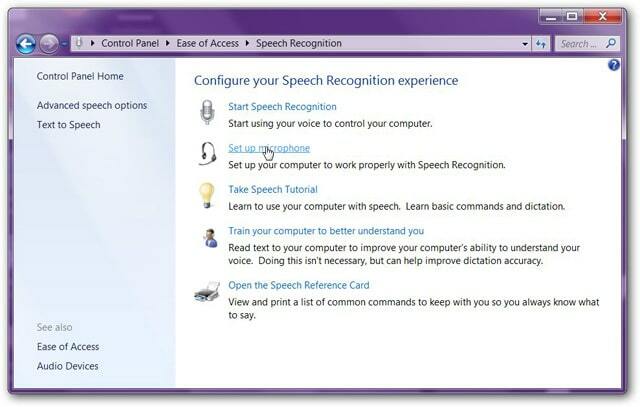 To train Speech Recognition in Windows 7, go to the Speech Recognition folder once again and click “Train your computer to better understand you.” This will open Speech Recognition Voice Training. The training takes about a 1/2 hour to complete and consists of reading out loud several paragraphs. The more you read, the more the program understands your speech patterns. That’s it. Once you’ve completed the training, you’re ready to use Speech Recognition. You can also opt to have the program begin every time you start Windows, or you can open it manually as you need it (the most common method). 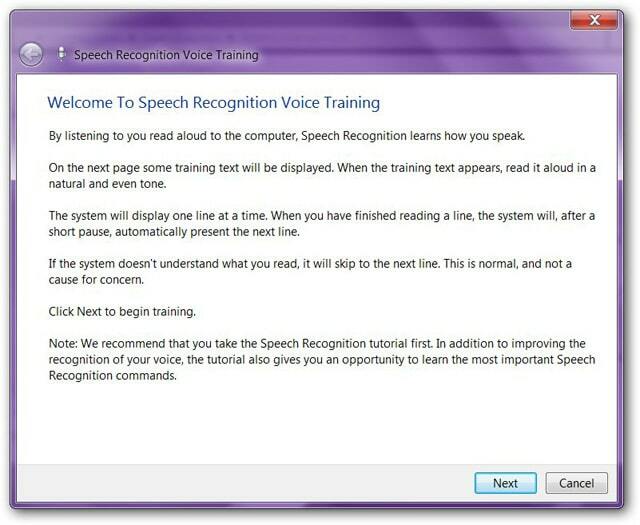 To learn more about using Speech Recognition in Windows 7, read the official tutorial directly from Microsoft.